World Futures Review September Special Issue: How to Teach Foresight? World Futures Review features a special issue for September entitled, Foresight Education! How should business schools incorporate foresight education and other topics are addressed. Several abstracts are featured below. Please note that the full articles will be free to read for a limited time. This article advocates that business schools include a formalized foresight educational experience more widely in their curriculums. As a group charged with educating business leaders of tomorrow, the cultivation of the skill-set and mind-set necessary for anticipating change and positioning organizations for future success and survival should no longer be left to chance. For the past decade, the Mendoza College of Business at the University of Notre Dame has required all undergraduate students to take a course titled Foresight in Business and Society. During this time, the Mendoza foresight faculty team has gained perspective on the design and value of a futures research learning experience for our students. Five underlying design principles are presented that have shaped the delivery and execution of the course these revolve around: developing great leaders, confronting ambiguous questions, experiential understanding, rigorous exploration, and anticipation as a force for good. As with any design-based perspective, the article concludes with challenges and pitfalls in recognition that the process is not always linear or smooth. But to other educators on this journey, the challenges are manageable and the promise and prospects for students makes it worthwhile. Most fields of study have introductory textbooks with the word “principles” in the title: “Principles of Economics,” “Principles of Ecology,” and many others. The principles explained in these textbooks are the core unifying and ordering concepts for their respective fields. They provide a frame of reference for students who are new to the field and taking the first steps toward mastering it. The abundance of “principles” textbooks and long history of the use of core principles in education suggest that a clear set of unifying principles may be a useful way to teach students how to productively think about and understand complex topics. This article identifies and describes a set of core principles for thinking about the future based on a review of more than 50 years of published futures research literature. The ten principles are as follows: The future is (1) plural; (2) possible, plausible, probable, and preferable; (3) open; (4) fuzzy; (5) surprising; (6) not surprising; (7) fast; (8) slow; (9) archetypal; and (10) inbound and outbound. The principles are described and their potential educational use is discussed. Core futures principles may be useful for introducing students of all ages to thinking about and preparing for the future. Schools are better when futures studies are included in the curriculum. This is not common today but can become common with creative and persistent effort. A plan is offered for systematic and sustained promotion in the nation’s K–12 school system. Examples are provided of projects for age appropriate employ throughout K–12 schooling. World Futures Review (WFR) seeks to encourage and facilitate communication researchers and practitioners in all related fields. WFR relies on its readers to provide the necessary balance through their responses to controversial or one-sided material. To submit your work to this journal, check out these guidelines! Notre Dame logo attributed to Free Photos. Idea photo attributed to Free Photos. Classroom photo attributed to Free Photos. Call for Papers: World Future Review! World Future Review is currently accepting submissions concerned with futures research. The journal publishes foresight literature addressing topics informed by technology assessment, policy analysis, operations research, issues management, competition research, and more. To find out more about the manuscript submission guidelines and how you can submit your manuscript to World Future Review, click here. Forestry and forest products research has entered into a robust research agenda focused on creating nano-sized particles and nanoproducts from wood. As wood-based materials can be sustainably produced, the potential of these renewable products could be limitless and include high-end compostable electronics, paint-on solar panels, and lightweight materials for airplanes and cars. Others warn about potential serious negative health and environmental consequences. Either way, wood-based nanomaterials could disrupt forestry as we know it. This article is a summary and analysis of a collaborative research project exploring the futures of wood-based nanomaterials within the context of the futures of forests and forest management within the United States. We start by describing the history of forestry through the lens of the U.S. Forest Service, then describe nanotechnology in general and wood-based nanocellulose specifically. Next, we outline the Manoa School alternative futures method, and how we used it to design and carry out a “complete futures of x” project. Following the Manoa School approach, we describe four alternative futures for forestry and forest management. We conclude with implications for the future of forestry, forests, and forest-based nanomaterials, as well as a discussion on the implementation of a complete “futures of x” project. You can read both the June 2016 issue and the article “Alternative Futures for Forest-Based Nanomaterials: An Application of the Manoa School’s Alternative Futures Method” from World Future Review free for the next two weeks. Want to stay up to date on all of the latest research from World Future Review? Click here to sign up for e-alerts! Introducing the New Editor of World Future Review! James Allen Dator is Professor Emeritus and former Director of the Hawaii Research Center for Futures Studies, Department of Political Science, and Adjunct Professor in the College of Architecture, of the University of Hawaii at Manoa; Co-Chair and Core Lecturer, Space Humanities, International Space University, Strasbourg, France; Adjunct Professor, Graduate School of Futures Strategy, Korean Advanced Institute of Science and Technology; Daejeon, Korea, and former President, World Futures Studies Federation. He recently became editor in chief of the World Future Review. He also taught at Rikkyo University (Tokyo, for six years), the University of Maryland, Virginia Tech, the University of Toronto, and the InterUniversity Consortium for Postgraduate Studies in Dubrovnik, Yugoslavia. He received a BA in Ancient and Medieval History and Philosophy from Stetson University, an MA in Political Science from the University of Pennsylvania, and a PhD in Political Science from The American University. He did post-graduate work at Virginia Theological Seminary (Ethics and Church History), Yale University (Japanese Language), The University of Michigan (Linguistics and Quantitative Methods), Southern Methodist University (Mathematical Applications in Political Science). What will distinguish WFR from other futures journals is that (as a rule) it will not have articles about “the future” or “the futures of x”, but rather about futures studies as an academic and consulting discipline—the roots of futures studies, its present state, the preferred futures for futures studies itself. I am especially interested in anything that states what you see are, or should be, the intellectual roots of futures studies, not only in terms of other futurists, but more generally: what scholars, schools of though, ideologies, social theories, methods, underlay what the early futurists thought and wrote? What now? What should underlie them? What assumptions do we make about “time”? “Where” is the future? What is the role of human agency vs. other forces (such as technology, for example) in shaping the futures. Your thoughts on the role of language in shaping our ideas about futures (as Bae Ilhan has done about East Asian languages vs. English/French futures studies, for example). I imagine there are aspects of Hungarian that lead to certain ideas about the futures that are different from English, French, or Spanish. Or maybe not! Interested in submitting a manuscript to the World Future Review? Find out more about submission guidelines here! 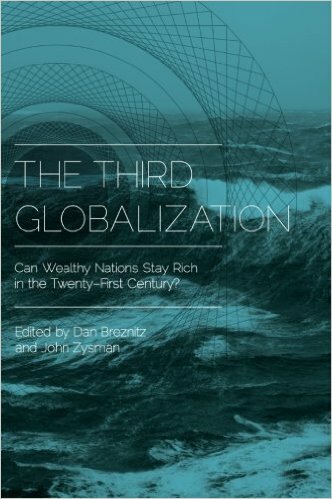 Book Review: The Third Globalization: Can Wealthy Nations Stay Rich in the Twenty-First Century? The Third Globalization: Can Wealthy Nations Stay Rich in the Twenty-First Century? Edited by Dan Breznitz, John Zysman . Oxford, UK and New York: Oxford University Press, 2013. 432 pp. ISBN 978-0199917822, $105 (Cloth); ISBN 978-0199917846, $39.95 (Paperback). Hiram Samel of the University of Oxford recently took the time to review the book in the October Issue of ILR Review. A marked lack of sustainable economic growth has become an unfortunate but predominant characteristic of wealthy nations in the seven years following the financial crisis. Whether policymakers pursue fiscal stimulus or austerity, the outcome has been far from satisfactory. Notwithstanding Carmen Reinhart and Kenneth Rogoff’s argument that financial crises require a longer recovery time, is it possible that policymakers have the mix of policies wrong? The vast majority of wealthy states, after all, liberalized markets in the past two decades with the hope of emulating U.S. innovation and growth only to find instead they needed to reinsert themselves when capital and labor markets stalled. Given this failure, how prepared will the same states be for the next era of global competition, when emerging economies such as China and India that have benefited from rapid technological advances begin to leverage their economic and intellectual scale? The authors of The Third Globalization address this question with a series of essays framed around a dilemma the editors, Dan Breznitz and John Zysman, term the “double bind.” In psychiatry, individuals face a double bind when they are unable to decide between conflicting statements from highly valued but distinct actors. In adapting the concept to political economy, the editors argue that politicians and policymakers in wealthy nations face similar indecision. On one hand, they need free markets to stimulate innovation and growth while, on the other hand, they need to reassert control of markets to foster social stability. The question is, can they do both at the same time? You can read the rest of the review from ILR Review for free for the next two weeks by clicking here. Like what you read? Click here to sign up for e-alerts and have all the latest research and reviews like this sent directly to your inbox! If your New Year’s resolution was to eat healthier or lose weight, you mostly likely came across advice to eat more fish. The American Heart Association, for example, recommends 3.5 oz servings of fatty fish two times a week. But things can get a little confusing at the grocery store when you’re faced with the dilemma of getting a piece of salmon labelled “wild caught” or “farmed.” What’s the difference? Why not go with the cheaper option? In the latest issue of World Future Review, associate editor Rick Docksai interviewed Muhammed Saidul Islam, author of “Confronting the Blue Revolution: Industrial Aquaculture and Sustainability in the Global South.” In the interview on aquaculture business, Docksai and Islam discuss sustainability, workplace conditions, marketing schemes, and more. In coastal communities throughout the developing world, farmers are cordoning off swaths of beaches, lakes, and rivers to cultivate stocks of fish, shellfish, and shrimp for markets in the more affluent parts of the globe. 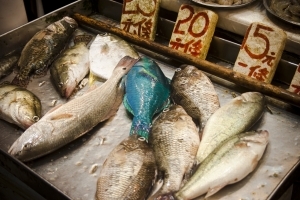 These “aquaculture” industries, as the fish farms are known, satisfy a massive global consumer demand for seafood while bringing considerable business profits to the farmers and distributors who make their livelihoods in them. But the business carries a heavy price for the communities in which the aquaculture industries set up shop, according to Muhammed Saidul Islam, an assistant professor of sociology at Nanyang Technological University in Singapore. Islam investigates the expansion of aquaculture businesses up-close in his new book, Confronting the Blue Revolution: Industrial Aquaculture and Sustainability in the Global South (University of Toronto Press, 2014), and finds widespread destruction of marine estuaries, wetlands, and coastal forests in their wake. What’s more, nearby farmlands and subsistence fishing industries have been ruined as a result of these aquaculture farms, to the point where whole communities have risen up in protests—protests that local governments have often suppressed with shockingly brutal force. Meanwhile, the farms are dependent on large cadres of impoverished workers who suffer many overuse injuries and debilitating infections due to slavishly long hours, poor sanitation, and lack of health care. You can read “The Hidden Cost of Seafood: An Interview with Muhammed Saidul Islam” from World Future Review. for free by clicking here. Like what you read? Click here to sign up for e-alerts and have all the latest news and research from World Future Review sent directly to your inbox! Welcome to 2015! You may have already noticed that the hover boards and flying cars we were promised in “Back to the Future Part II” have failed to appear. There also seems to be a severe lack in the teleportation and time machine department. That summer home on Venus? Better use that money on something a little more practical. Fortunately, the future is brimming with possibility. All one needs to ask is: what if? That’s what drove the authors in the latest issue of World Future Review. Can genetic modification ensure the survival of humanity? Will the internet evolve into a “global brain”? What role will intelligence machines play in the workforce? Nuclear fusion of helium-3 (3He) can be used to generate electrical power with little or no radioactive waste and no carbon emissions. Some forty-four tons of this fuel could meet the electricity needs of the United States for a year. Although rare on Earth, an estimated one million tons of 3He has collected on the surface of the moon. While it would cost approximately US$17 billion to develop a mine producing one ton of 3He per year, such an operation is commercially viable over the medium term given the estimated value of that ton of fuel: US$3.7 billion. This article outlines the technical and economic issues related to 3He and its extraction, and it presents a novel approach to estimating the worth of the fuel. 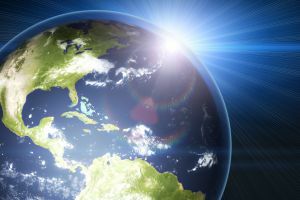 The potential of 3He as a future energy source is set in the context of global energy forecasts and international efforts to investigate lunar 3He resources—including a recent Chinese mission. You can read this issue of World Future Review for free for the next two weeks! Click here to view the Table of Contents. Want to keep up on all the latest research from World Future Review? Click here to sign up for e-alerts!